Join St. Pius X - St. Matthias Academy for our Open House! All 6th, 7th and 8th grade families are invited to meet teachers, students, see our upgraded facilities and all the PMA community has to offer. Reserve your tour spot today! 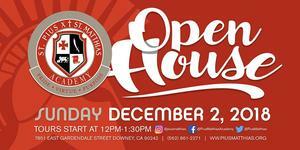 Join St. Pius X - St. Matthias Academy for our Open House! All 6th, 7th and 8th grade families are invited to meet teachers, students, see our upgraded facilities and all the PMA community has to offer. Complete the form below to reserve your tour spot.